I think I know what you're thinking.......every day is the same lately.....get up, watch soccer, have lunch, watch soccer. And you are right. Elaine and I have been involved with soccer since the early 80's when our oldest son, Chris, started playing youth soccer. I was a professional soccer referee for years. But, in all that time we have rarely seen more one or two World Cup games.....usually the ones in which the U.S. was playing. Why? There just wasn't the time to spend watching 2-4 matches a day for a month. We were raising 5 children, while we both worked full time. Now we have the luxury of time, and no work schedule, yet, to interfere with the endless hours we are devoting to watching the FIFA World Cup matches this time around. As you may, or may not know, the World Cup is only played every 4 years.....kind of like the Olympics....so this time we decided to watch every game we were able to watch, and that has been pretty much 95% of the games played to date. I remember back in 1998 we were camping with friends up on the Kern River near Lake Isabella in California. 1998 was also a World Cup year, and the U.S. was playing Germany one day during our vacation there. We made arrangements with a small pizza parlor in the little town of Kernville for our small group to take over the parlor, and watch the match on their TV....that was the only match we watched that year, and that has been typical over the years. Of course, the USA lost that match as they routinely did back in those days. We did not win a single match in that World Cup. Advance the calendar forward 16 years and we have the USA advancing out of group play with a legitimate chance to win against Belgium on Tuesday. This current incarnation of the World Cup has had some very good matches with teams coming from behind late in matches to win, or tie. Sunday was no exception. Mexico held a late 1-0 lead over Netherlands with 3 minutes to go in regulation. They had played great defense for 87 minutes, then, suddenly, the Netherlands scored to tie the match, and just a few minutes later in stoppage time the Netherlands scored on a controversial penalty kick to win 2-0. The second match between Costa Rica and Greece was equally exciting. 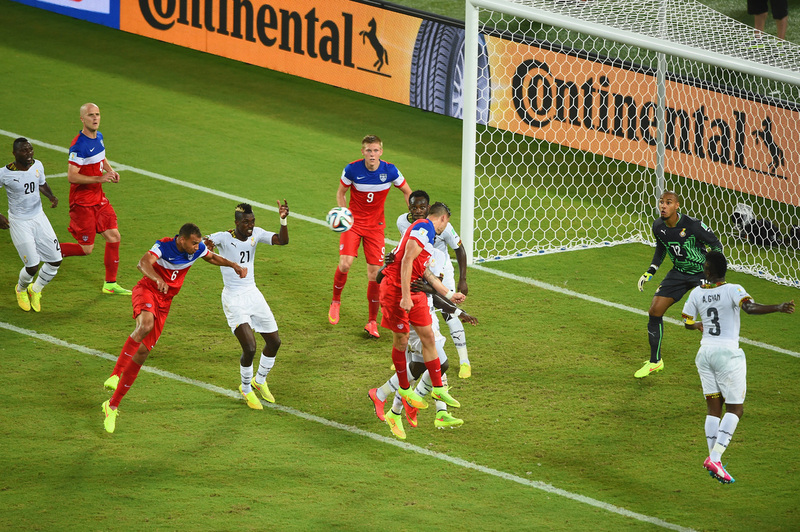 Costa Rica led 1-0 late in the match only to have Greece score the tying goal with just seconds to go in regulation. Ultimately the match went to "kicks from the mark" in which Costa prevailed 5 kicks to 3. In between the matches I took a leisurely ride up to the Emerald Bay overlook....seriously....I was not trying to set any new personal records, and I didn't........although my ride took me just 4 minutes longer than my best time. I think I've done this ride close to a dozen times now and I never get over the views, and this time, since I was not racing to better my time I stopped long enough to document it with a few pictures. Around 7:30 we convened over to one of our neighbor's sites to meet some more of our soon to be co-workers, and imbibe a little vino while warming ourselves by their campfire. We had a great time laughing, and sharing workamping stores, but by 9 we were chased inside by the mosquitoes. So, I guess, overall, Sunday wasn't exactly the same as Saturday, but it was just as good. Saturday was the first day of the "knockout round" in the 2014 installment of the World Cup Futbol tournament. The WC begins with each team playing 3 matches in their assigned "pool". The USA was in Pool G....there were 8 pools total with 4 teams each for a total of 32 teams. You can win, lose, or tie in the first three matches before someone is eliminated. At the end of "Pool Play" the 2 teams with the most points (3 points for a win, 1 point for a tie, and 0 points for a loss) from each pool advance to the "Group of 16", which is the the "knockout round". There must be a winner in each match from this point. If a match ends in a tie after the first 90 minutes the teams then play an additional 30 minutes. If still tied then the match is decided by "kicks from the mark" to determine the winner. Each team starts out taking 5 kicks from the penalty mark. If at the end of the first 5 kicks one team has converted more for goals than the other that team is declared the winner. I wrote all that to write this.......the first match on Saturday (Brazil vs. Chile) was such a match.....at the end of 120 minutes the match was tied 1-1, and went to "kicks from the mark" to determine the winner. Brazil converted 3 out of 5 kicks and Chile 2 out of 5 kicks, meaning Brazil won the match. A very exciting match and multiple opportunities for each team to have won the match in the 30 minute overtime. The second match Saturday was between Uruguay and Columbia (Uruguay was the team with the suspended "serial biter"), which was won easily by Columbia. Other than the break in between the two Saturday matches we spent the better part of the day watching the first two matches of the "knockout round". In between those matches we drove over to a local thrift store to pickup a few more items for our kids' visit later this week.....an Igloo ice chest (we'll need more ice than our small refrigerator can hold), another beach umbrella, and a small DVD player for the outside TV......we spent $43 ($19 for the ice chest, $15 for the very nice DVD player, and $9 for the umbrella)......the ice chest and umbrella will be re-donated at the end of the summer. The weather will begin to really warm up now over the next week with temps getting to 86 on Sunday, and as high as 92 over the next 10 days. We spent the rest of the afternoon reading outside, and enjoying our last few days of freedom before we begin to work. Back in my workaday life Friday was my second favorite day because it meant Saturday was just around the corner. Even though every day now seems like Saturday, 5th Saturday, aka: Friday, is still one of my favorite days of the week. The last time I had my ears lowered was back in mid May at the Sparks, NV Supercuts, and I was in serious need of a hair follicle adjustment.....the nearest Supercuts is in Carson City, which is also where the nearest TJ'S, Goodwill, In 'N Out Burger, and Costco are located, so it was off to Carson City around 10 am for a haircut, and some much needed shopping. The morning temps were still in the low 60's when we departed TVC, and as we descended into the Carson Valley it was only 75 there. Due to the rain a couple of days ago the air was surprisingly clear. Our first stop was the Carson City Goodwill where we both found things we could not live without, as well as some things we wanted to get for our kids visit over the upcoming 4th of July long weekend. 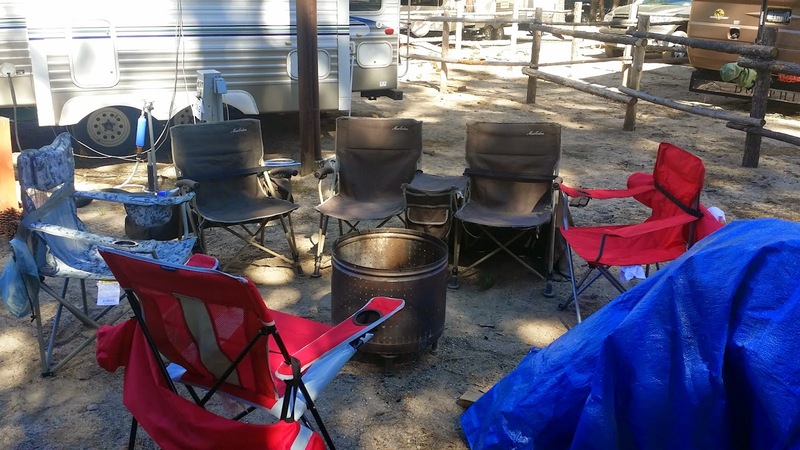 We needed more camp chairs, and an outdoor toaster. This Goodwill stocks a lot of "seconds" and we were able to find a 4 slice toaster for $8, and 3 camp chairs averaging about $8 each. I'm not sure why the toaster was returned because there is no obvious damage, and it works. Each of the chairs had a minor flaw, but they are essentially brand new, so we got 3 chairs for the cost of one. Not only that I found 2 more pairs of cargo shorts to add to my burgeoning collection, and another pair of mountain bike shorts for $4 each. TLE came away with a sweatshirt, a pair of shorts. Next it was time to visit Lowe's where I bought a diesel fuel can (yellow). Right now our diesel tank is down to about 35 gallons. I'm sure that is enough to get us back over the hill to Carson City where fuel prices are about 40 cents a gallon less than here in the Tahoe Basin, but I'd like to add, over the next few weeks, more to our tank, so I'll fill up the 5 gallon can a few times over the next few weeks to bring the level up to a more comfortable level. Then it was time for the much needed haircut, followed directly by a stop at the local In 'N Out Burger for lunch......and there I am at the In 'N Out Burger sporting my new coif whilst awaiting our lunch order......two #2's......cheeseburger, fries and a drink for each of us. has it been 3 years since I had one of their burgers? 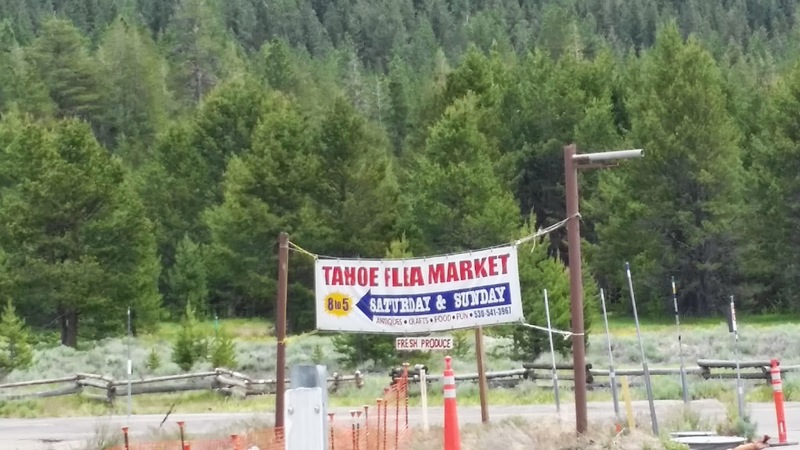 After quick stops at TJ'S and Costco we were on our way back up the hill into the Tahoe Basin......the temp in Carson City got up into the mid 80's while we were there, but as we climbed HWY 50 upward, and upward the temp dropped back into the mid 70's. 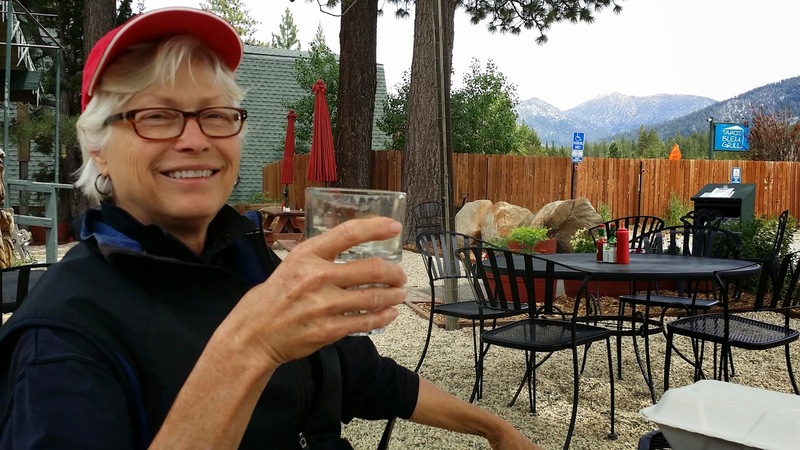 We made a quick stop at the one thrift store in South Lake Tahoe we had yet to visit, and TLE found one more shirt she could not live with out, then it was homeward bound. While we were in Carson City we both got the e-mails we have been waiting 6 weeks to get from the corporate headquarters of Encore Resorts (they own TVC) asking us to complete, online, a form they needed to do our background checks....YAY!!! Within a few days we should be able to start our jobs and earning money. Once we got back home we hopped on my computer and got the forms submitted. 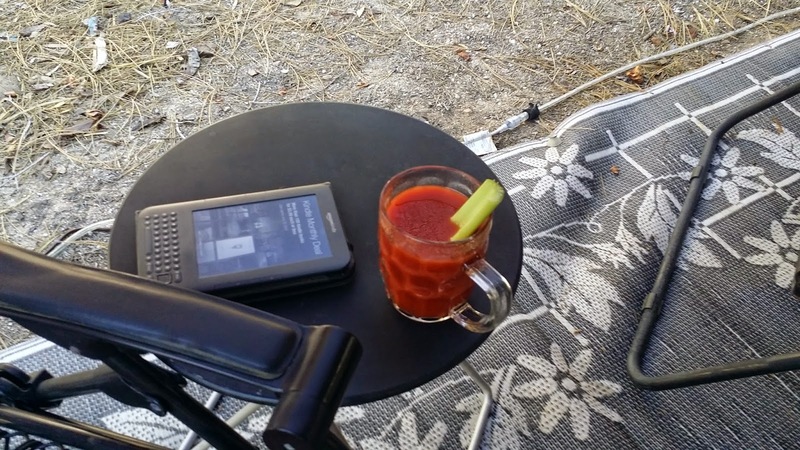 Then it was time to sit outside reading, and sipping a Bloody Mary.....TLE makes the best I have ever had! I turned on our XM Radio to channel 26, Classic Vinyl, and spent the rest of the afternoon and evening listening to a really great playlist. I finished one book, and then read another one finishing by 11:30 pm. What a perfect 5th Saturday Friday was......everything went according to plan, and now we are pretty much ready for our kids to arrive this Thursday morning! We woke up Thursday morning to something different.....light rain. This is the first noticeable, sustained rain since the first week we were here when it snowed, and then rained for an entire day. By 11 am it had ended......I know, the graphic says it would stop by 7:45 am.....it didn't, but that's all good because we were inside anyway watching the USA lose 1-0 to Germany. In spite of the loss the USA progressed to the round of 16 which is the "sudden death" round.....a loss now and you are out. After the soccer match I took advantage of the end of the brief rain and wiped the car down. One benefit of the rain was it settled down the pollen from the pine trees that has been covering everything like a blanket for the past few weeks. It's been kind of discouraging because within 15 minutes of wiping the car off it would be covered with this yellow pollen dust again. Everyone says the pollen should let up pretty soon, and we are hoping that the rain has drawn a line in the sand at last. One thing I forgot to mention was we received our new floor mats for the VW Beetle we bought on eBay. 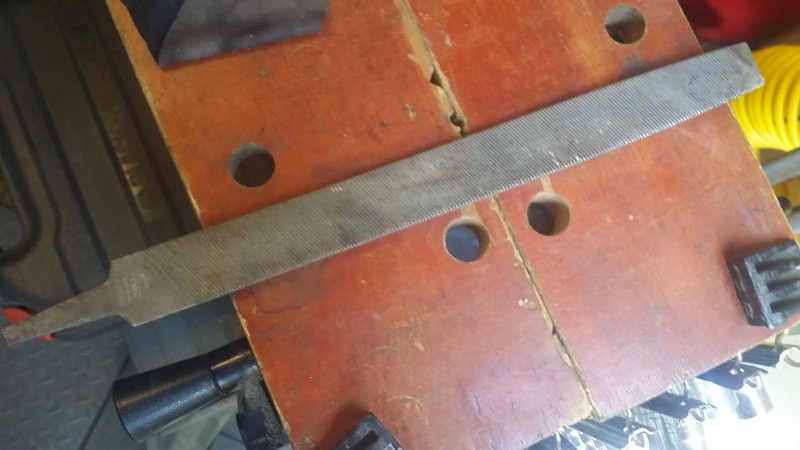 When we bought the car it only had one floor mat for the driver's floor, so we had wanted to get a new complete set. We finally ordered them a week ago, and they arrived Wednesday. By the time I finished wiping down the car, the outdoor cooking area, and picnic table it was time to watch the 1 pm WC matches. As it stands now the USA will play Belgium next Tuesday hoping to win and advance to the round of 8. That it has now been two weeks since the World Cup began is hard to believe. On the other hand it has pretty much dominated our days for two consecutive weeks, and we have not done much else but watch three, or four matches a day. Friday will be a day off from soccer, so we are planning to head over to Carson city to do visit Trader Joe's and Costco, and maybe do a little "junking". One update for those who do not follow World Cup soccer.....I wrote about the Uruguayan player, Suarez, who bit an Italian opponent. The news came in yesterday that FIFA (the international governing body for professional soccer) has suspended Suarez for 4 months.....he will not play another match in the World Cup, and, in fact, cannot even be present at a soccer venue anywhere in the world for that 4 month period. Will that change his behavior? I don't know.....he has previously been suspended for 1 month, 2 months and now 4 months.....they keep doubling the suspension time....so far it has not impressed him enough to change his behavior. That was our Thursday......thanks for stopping by! 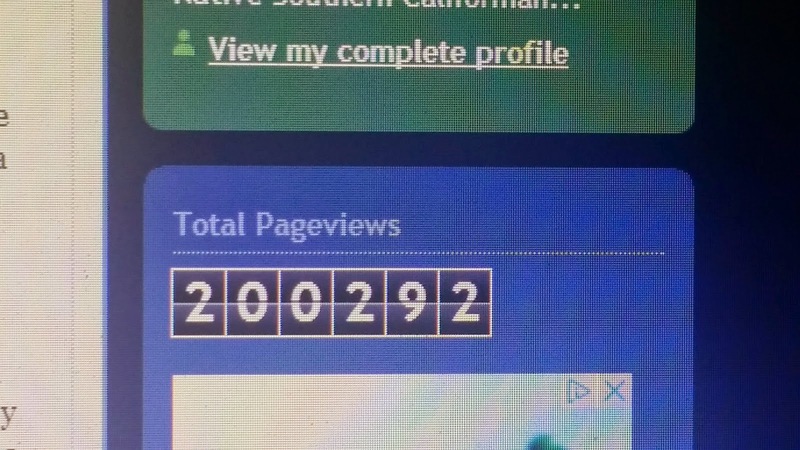 By blogosphere standards this number is a rather modest achievement......as of Wednesday my blog passed 200,000 page views, and as of this morning sits at 200,292. A big "Thank you" to all of you who follow my sometimes incoherent ramblings each day......I am continually humbled to know that people who are not related to me read my daily missives. 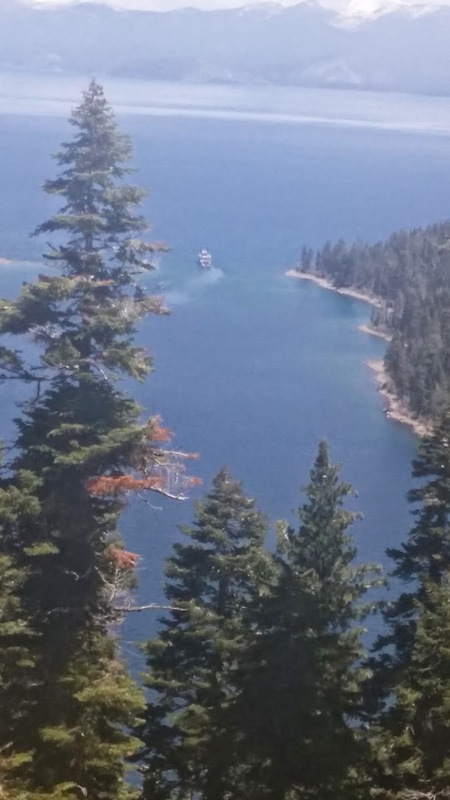 Wednesday was just another gorgeous South Lake Tahoe day.....the kind of day that has become routine, but deeply appreciated each and every day. According to the 10 day forecast we are due for a minor heat spell beginning this Sunday when it hits 85, and then tops out on 90 July 3rd. 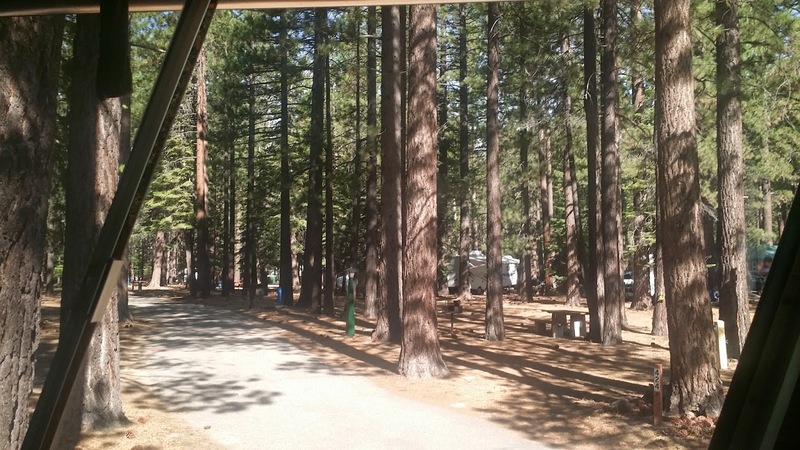 The summer vacation season here in SLT is in full swing now as we see the campground staying fuller throughout the week. There is still the vacuum effect on Sundays, but a new wave of vacationers begin arriving Tuesday each week now. Thankfully the campground WiFi (Tengointernet) is working again....it was out for about 10 days. As the SLT seasonal population steadily increases the Verizon broadband gets slower and slower, so reliable WiFi here at TVC will become more valuable as the summer progresses. Not much else to report about Wednesday.....of course there were a few soccer matches viewed, but the game we are awaiting with enormous anticipation is the USA vs. Germany match Thursday.....the USA has to tie, or win to advance to the round of 16......in fact, I need to finish this entry because that game starts in just to minutes.......I believe.....I believe! In just a little over a week two of my daughters (Sharon and Kate) will be arriving to visit for a few days. Sharon will be accompanied by her fiance, Rod, and Kate by her soon to be fiance, Nick. 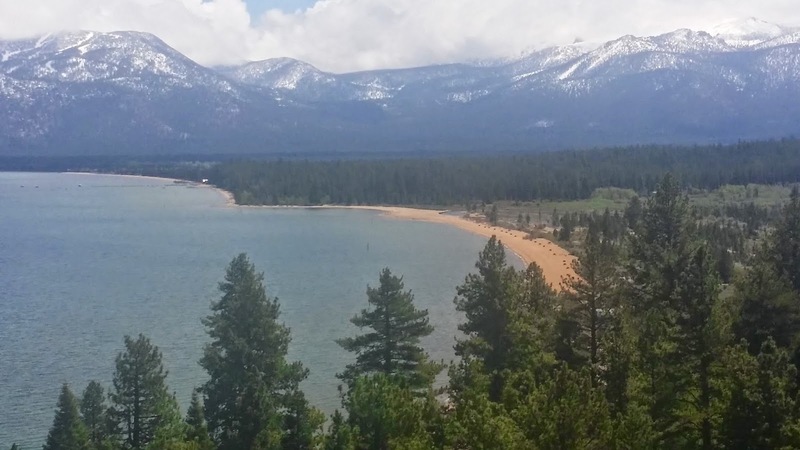 When we left Riverside back in early March we had talked often about them coming to visit us while we were in Lake Tahoe, and now the time is here. As I look at the calendar over my desk the empirical evidence is that we have been gone from Riverside for just four months, but it seems much longer to me. During that four months we have traveled over 3,700 miles and visited 8 states, which is less than a thousand miles per month, but we have seen and done so much it just seems as if more time should have elapsed. Elaine and I were discussing Tuesday about how, for the first time in a while, we are not talking about where we head next, and let's face it, we've got some cool stuff coming up on the horizon (2 months on the Oregon coast at a lighthouse, a month at Amazon in Fernely, NV, our daughter's wedding in January), but we are so content here in SLT that we are just living in the present. I'm sure as we get closer to the end of August we will begin to look forward, but for now we love where we are at, and what we are doing. After the morning soccer match we walked over to Raley's to do some "small" shopping. If you have never been to this particular Raley's it is a beautiful store.....it reminds me of the old Pavilions stores owned by Safeway. It is a giant supermarket with everything under the sun, and it is within walking distance! In the afternoon we spent another 90 minutes at the TVC office continuing our orientation and training with Debby, and actually checked campers in, and took reservations in the computer system. We are both getting more comfortable, and looking forward to starting our jobs. TLE treated me to street tacos for dinner, and then she spent a couple of hours watching recorded cooking shows such as "Chopped", and then we watched a movie I had recorded over the weekend called "Ender's Game" starring Harrison Ford. If you are a SciFi fan you would like this movie and it's premise. I won't give away the surprising ending, but we enjoyed it. The weather.....well, what is there to relate that I have not already related previously that would only serve to reinforce the perception by some that I am just "rubbing it in"? 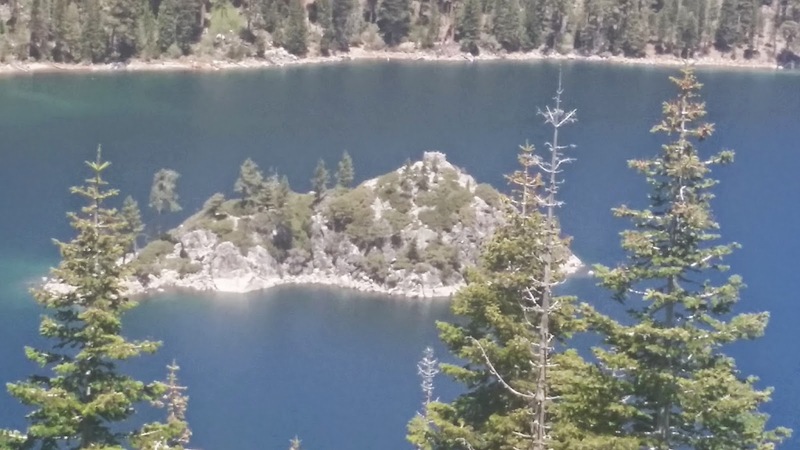 The first time I made the ride up to the Emerald Bay overlook I wasn't even sure I could do it without walking my bike up those steep switchbacks, but I did make it without stopping. It took me just over 49 minutes to ride the 8.4+ miles to the top.....I put in a "+" because every time I reach the top the distance shown on the Garmin screen is different, even though I ride the same route every single time.....the first time it read 8.64 miles, and it has been different every single time ranging from yesterday's 8.41 to the initial 8.64 back in May. That I might actually do that ride in under 40 minutes was not even in my thinking then, and certainly it was not Monday. I was just hoping to be within a minute on the high side of my prior best time, but then as I rounded the last switchback and saw my elapsed time I started to think I might come in under 40 minutes......and I did.....39 minutes, 25 seconds. I know some of those "young bucks", who routinely pass me on the climb every time I do it, probably do it much faster than I, but I'm competing against myself, not them. That they do it on "fixed gear" (single speed) bikes is slightly demoralizing, and makes me glad I am riding a 27 speed bike...........I use every single one of those gears on this ride. While I was off gallivanting TLE* did her own workout using the portable stairclimber we bought a couple of summers ago at a thrift store in Twin Falls, ID. I always get a kick out of her workouts, because they usually involve some form of exercise combined with watching the "Food Channel".....I guess that's the best way to be around food you like without consuming any calories.....:D I can't argue with her method because it is obviously working, and she looks great! Around 1:15 we walked over to the TVC** office to begin our training on their computer software system, and office procedures. We had a very good trainer in Debby Kasson (of Bill and Debby fame), and spent about 90 minutes filling our brains up with a lot of new information. Fortunately for us their software management system seems somewhat intuitive. We'll spend a few more hours this week getting oriented and hopefully will get our official start date within the next 10 days.....until then we are enjoying our life of leisure. The weather continues to be delightful....mostly clear blue skies and temps in the mid 70's, and humidity so low it's not even a factor. We are closing in on 6 weeks here at TVC**, and are still beyond happy with our decision to "summer" here. As is our habit on Monday evenings we watched "Longmire", "Masterchef" and "24" and were in bed before 11:30. Did we win, or did we lose? Until the U.S. Men's Soccer team scored the go ahead gold with about 10 minutes to go in Sunday's match I would have been more than happy with a tie game against the #4 ranked soccer team in the world (the USA is ranked #13 by FIFA). Just 16 minutes earlier we had been down 1-0 to Portugal, but we scored the tying goal, and then we were just grateful to be tied. Then we were ahead 2-1 until 20 seconds to go in the extra injury time when Portugal scored to tie the game. Even though the match ended in a tie, it felt like we had lost. Nevertheless, the U.S. got a point, and we are tied with Germany at 4 points a piece going into our game against Germany this Thursday. I kind of got ahead of myself here......The USA vs. Portugal game was at 3 pm Sunday, so what did we do the rest of the day? Here goes.....It was cold enough Saturday night that the interior bedroom temperature got down to 56 degrees.....of course, that was with the bedroom window open, but it was still too cold at 9 am, or even 10 am to eat breakfast outside, so we stayed inside while watching the 9 am WC match between Belgium and Russia, which Belgium won 1-0. The Noon match between South Korea and Algeria did not interest us much, so at 11 am we decided to take a bike ride up to Meyers, and then stop at the weekly Flea Market on Elks Club Drive on our way back to see if they had anything we couldn't live without. 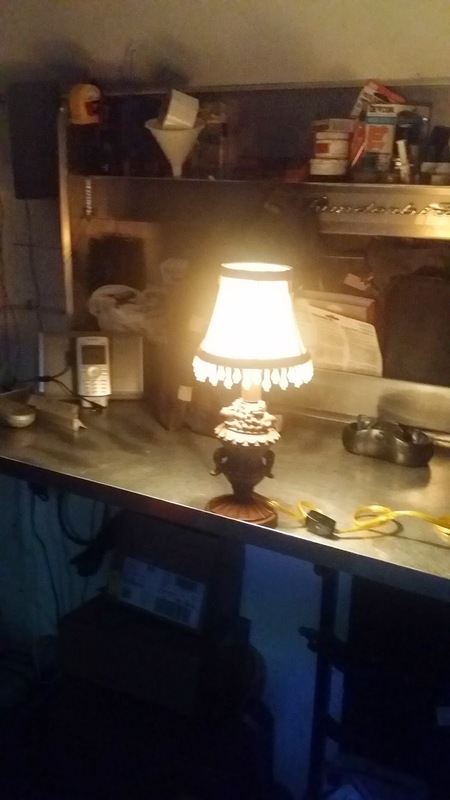 We came away with two items.....a small lamp that will act as a "night light" in the trailer for our kids when they come to visit in 10 days, plus a very course file, which I have needed for sometime. We stopped off at Raley's on the way home to pick up a few things, and were home by 1:30 mentally gearing up for the aforementioned matinee match between the U.S. and Portugal. Shortly after the finish of that match we began dinner preparation. TLE had prepared some vegetables to be roasted on the BBQ, as well as some corn on the cob, and two bison burger patties.....one of those rare occasions when I actually cooked all three items on the menu. We ate our post game meal outside accompanied by the soothing music of the XM Radio Siriusly Sinatra channel finally heading inside around 7:30 as the temperature began to drop. It's kind of cool to sit here writing my daily blog entry while looking out the salon window seeing campers going about their camp chores......seeing smoke curling up from several campfires.....seeing the sunlight filtering downward through the thick grove of pine trees......seeing people talking, laughing, and embracing as they prepare to head back to their real world. Within a few hours the chores will be done, the cars will be packed full of tents, sleeping bags, camp stoves, lanterns, tarps, and air beds......the fires will be out......the goodbyes will have been said, and another weekend chapter in the life of TVC will be in the books. Soon section "E" will have that "empty" feeling again.......and once again those of us who have chosen this nomadic existence will have smiles plastered across our faces.....smiles that belie the feeling of satisfaction which comes from knowing we are already home.......we won't spend the next few weeks dreaming about the next weekend trip.....there will be no bittersweet feelings. Why is that? What does it mean? It means we are living the dream........the dream where every day feels like Saturday. So, what did Saturday look like for us? Let's see......it warmed up so quickly that we decided to cook breakfast outside while watching the first WC game of the day. We had blueberry pancakes, scrambled eggs and nitrate free sausage. The first match of the day was between Argentina and Iran. Argentina was the heavy favorite in the game, but Iran held them to a scoreless tie as they headed into the 3 minutes of "extra time".....Argentina managed to score the only goal of the game just a few seconds into the "extra time" period for the victory. It was a lovely day to sit out side watching three good soccer matches.....of course, in between matches there are things to be done, even if you are living the dream. Ordinary stuff life dumping the "black" tank, washing dishes, cleaning the outdoor stove, but it's all good. Quick, before the broadband disappears! When we first arrived at TVC* we had access to a pretty good version of Tengointernet for the first 3 weeks, then something happened and it stopped working. "They" (Tengo and AT&T) have been attempting to fix it ever since. So, okay, we have an alternative......individual hotspots on our Verizon cell phones, and they work pretty well Monday through Thursday, but as the vacationers, and weekenders, and seasonal workers arrived here in SLT** their presence puts a significant strain on Verizon's local cell towers. At times, during the day, it is difficult to get online at all. We usually see a slow down late Thursday afternoon, and it continues until early Sunday Afternoon. I have found.....and I say "I", because TLE*** is not usually up early enough to appreciate this, that the speed is pretty good until 9 am over this three day period, so I have to get up pretty early to get the blog done, especially if there are pictures to upload.....a minor inconvenience, especially since I no longer need as much bandwidth as I did prior to selling my insurance business to my son. We woke up Friday morning to a full section "E".....we are in section "E".....and until this weekend we have not seen our section very full at all......now it is packed with weekend tent campers......for me "packed" means about 90% capacity. It would be easy to get a little irritated with all the folks running around, but this is Americana at its finest. In spite of the crowds it is relatively quiet......no raucous parties....no loud music.....just the sound of people, young and old, enjoying the great outdoors. I have no doubt that some of these kids will grow up and decide to live full time in an RV....this is where the dreams are born, and begin to take shape. So, was Friday (5th Saturday) any different from any other day here in paradise? Not so much that you could tell.....we hung out around the coach doing chores....sweeping, cleaning, watching 3 more WC**** soccer matches, reading, making small repairs, watching the arriving campers trying to back their RV's into their site for the weekend, or week as the case may be, and just enjoying the "warmed up" weather. Thursday started off like every day since the prior Thursday has......watching WC* soccer....first up was Columbia vs. Ivory Coast at 9 am, then Uruguay vs. England at Noon. Columbia prevailed 2-1 and Uruguay 2-1....both were good games. I bought a set of used golf clubs about 6 weeks ago at the Goodwill in Carson City, but as of Thursday had yet to use them. Well Thursday was as good a day to check them out as any other lately, so I put them in the VW and headed over to Lake Tahoe Gold Course to hit a large bucket of balls. I spent about 40 minutes working my way through my "woods" then the various irons. The last time I hit a bucket of balls, and played gold was almost exactly 2 years ago, and before that it was probably 10 years. I had pretty good results with my irons, but will need to work at consistency with my "woods". On the putting green I spent another 40 minutes putting with each of the three putters I own, and am leaning toward the one in the picture, which had the best "feel" for me. Whilst I was off playing at the golf course TLE** walked over to Raley's to buy some supplies for pizza making. Debby and Bill invited us to join them as well as Billy, the onsite manager, for an evening of pool and darts at the local home of a friend who is out of town. TLE makes a mean anchovy pizza, and, as it turns out, Billy likes anchovy pizza, too. We were picked up by our hosts around 6:30, and we spent the evening eating pizza, playing "9 Ball", and then darts. As we near the end of 5 weeks here in TVC* we see subtle changes occurring......the average temperature is rising ever so slowly, and with that rise we see the park filling up with "vacationers". By "vacationer" I mean the longer term transient population is arriving. It is no longer only the "weekenders" invading paradise for a few days at a time......now it is those coming for a week, two weeks, a month, or the whole summer. As I sit here typing this entry, I look out the driver's side salon window, and see we now have a neighbor for the first time on that side. As I look out the front windshield I see a row of RV's lined up, many which have been here for over two weeks now. 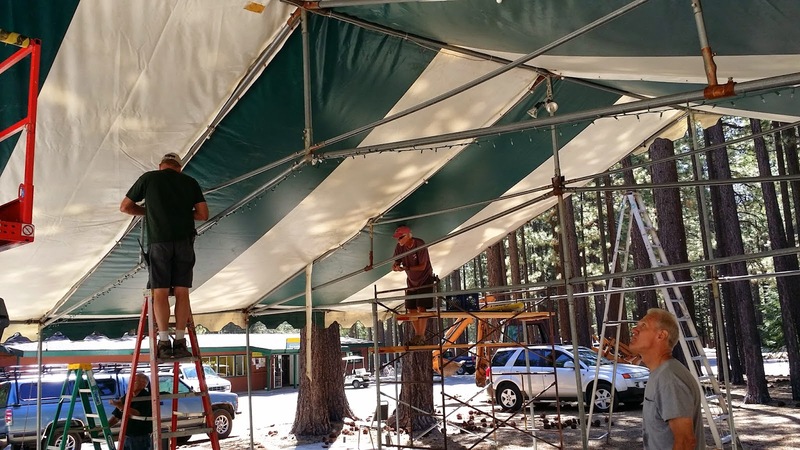 The summer population of SLT** is steadily increasing, and as that trend continues we see more seasonal businesses opening, and more of the local State and National Parks opening their gates. The Camp Richardson bike path is becoming quite congested with cyclists, and pedestrians....even early in the day now.....I may have to ride the highway the entire way up to Emerald Bay in the near future. We are still waiting to start working, and that is a whole other story. It is not just us, but pretty much everyone who has arrived to start working is still waiting to start working....it is a corporate issue. Our arrangement here is that we work for minimum wage, but are only charged for 1/2 our site cost......not a bad deal. The good news is "they" have decided, due to the corporate snafu, that we will not begin to be charged for our site until we start working and start getting paid. So we trundle on just enjoying being here enjoying the great SLT** vibe. So, what happened Wednesday that was noteworthy? Personally, I think just being able to spend every day this summer here in SLT* is noteworthy, whether, or not we work one solitary second....being able to watch pretty much every World Cup match we wish to watch is noteworthy......being where it is not 100 degrees, and 90% humidity is noteworthy......having complete control of what we do each and every day is noteworthy.....waking up every morning in a forest of sugar pines is noteworthy. We started out watching the first two WC*** matches of the day (Australia vs. Netherlands, and Chile vs. Spain), and then around 2 pm headed out for an 11.5 mile bike ride up to the end of the Camp Richardson bike path, stopping off at Sonney's BBQ on our way back for a pint and a plate of those amazing Nak'd Jalepeno Poppers before arriving back home around 4 pm to watch the 2nd half of the 3rd WC*** match of the day. So Wednesday was one more day lived well.....lived on our terms.....no schedules, no obligations, no worries.....Oh, I almost forgot.....Clayton Kershaw (Dodger's star left handed pitcher) pitched a complete game no-hitter striking out 15, with no walks. He was one bad throw by the short stop from a perfect game.....that is certainly noteworthy, too. Kershaw strikes out his 15th batter to end the game! To top it off I also broke my round trip record for the 17.2 mile course by 3 minutes covering the distance in just 1 hour and 9 minutes.....my previous best was 1 hour and 12 minutes......again, it's easy just to coast home after a great ride to the top, but I keep track of the total round trip time to push myself on the way home, too. 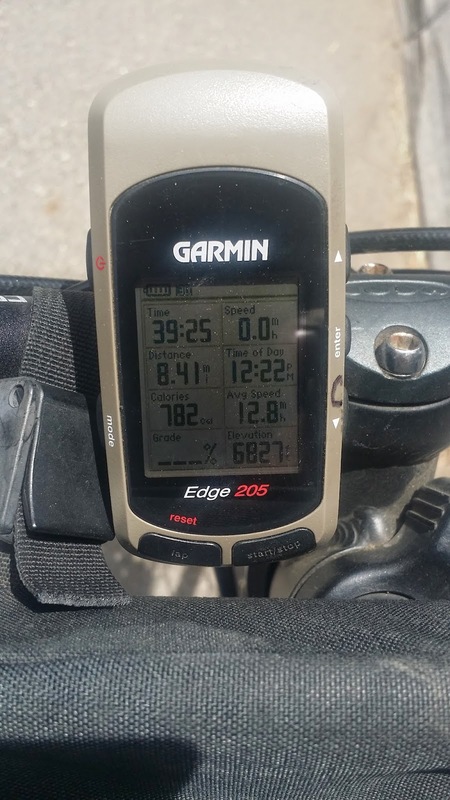 As you will recall, my first ride to the top back in the 3rd week of May took me over 49 minutes.....now I'm getting to where it may be possible over the next few weeks for me to cover the 8.6 miles to the top in under 40 minutes. The temperature when I left on my ride at 11 am was in the low 50's and I was once again all bundled up against the cold, and grateful for every piece of clothing I was wearing.....the high for Tuesday barely hit 61, and it was no day to spend too much time outside, so we spent more time watching World Cup Futbol**. The game between Mexico and Brazil was the best of the day ending in a 0-0 tie, but that was not the story of the match.....the story was the incredible goal keeping by Mexico's Ochoa.....he made 4, or 5 amazing saves enabling Mexico to keep the score tied.....Brazil was clearly the better team, but they just could not score against Ochoa. Around 5:30, after the final match of the day between Russia and South Korea (also ended in a tie, 1-1), I grilled a filet mignon that TLE*** had bought a few days prior....it was aged with very good marbling, and quite thick. It took a full 18 minutes to bring it to a satisfactory medium rare state. TLE*** added a salad and garlic laced mashed potatoes to compliment the steak, which was one of the best I have ever turned out. I have to be completely honest here......did I believe the U.S. National Team would win their first soccer match against Ghana? Nope. Why? Because Ghana has had their number the last two World Cups. There were a lot of unknowns about this USA team this year, but over 90 minutes some of those questions were answered.....1) Can they score....yup...they scored their first goal within the first 34 seconds of the match.....2) Can they defend.....yup....they spent 90% of the match on defense before conceding a tying coal in the 86th minute courtesy of John Brooks' header (see below). Should they have to spend so much time on defense....NO, and ball possession is something they will have to improve upon before their next match. The USA World Cup win over Ghana was the highlight of our Monday.....and was also the 3rd and final soccer match of the day Monday......next up for the USA is Portugal on Sunday. Monday was also time to defrost the freezer again.......it has been over 3 months since "we" had to do perform this task, and the low humidity we have been living in over that time has helped to keep the ice accumulation down. I use "we" in the "royal sense" of the word as that is TLE's* task.....I occasionally offer unwanted, unasked for suggestions from time to time, but basically stay out of her way for the 1 to 1.5 hours it takes her to do the deed. The next biggest story for the day was the cold weather supplemented by very cold wind, which made it undesirable to spend much time outside. I had aspirations of taking a bike ride, or going to the golf course to hit a bucket of balls, and I would have done both in spite of the cold, but the 20 mph wind on top of that convinced me Tuesday would be a better day for those outdoor activities. TLE* did brave the cold, and the wind to do her 4 mile walk......I stayed home and watched more soccer. Just after the conclusion the USA vs. Ghana match we got dressed and headed over to "The Cantina" for the weekly TVC** staff dinner. Monday is their "half price" night for a limited menu so on that score it was a good choice. If the food had only lived up to the half price promotion we would have been happy, but it lacked proper seasoning, and just did not demonstrate any pride on the part of the chef. Yelp gives them 3 stars on 127 reviews, but I would be hard pressed to give them 2.5......based on the comments I heard from others in our group I would say we were all disappointed. Nevertheless, the service was very prompt, and we had a delightful time conversing with our friends before heading home around 6:45. We closed out the day watching "Longmire", "Master Chef", and "24". The weather will continue to be cold for the next few days before warming up into the 70's again.....I think the high for Monday was only 62.
all my kids make me smile like this. Sunday began with text messages and calls from my kids wishing me Happy Fathers Day.....it is a day of re-affirmation.....it is a day when any doubts you may have had about what kind of father you were are swept away by your children......you see the kind of adults they have become, and for those who have had children, the kind of parents they have become and smile. I guess, to some degree, the kind of people your kids become as adults is testimony, in some small way, to the kind of parent/father you have been. I know that as my dad looks down on his 5 kids, and the people they have become that he is smiling just as I am today......I know, just as he does, that I did an okay job with TLE raising our 5 kids. I appreciate those of you who keep reading this blog every day even when we are sitting in one place for a long period of time.....even when there are days I struggle to write something that seems interesting to me. I know, intellectually, that we live a pretty cool nomadic life, but even knowing that, sometimes as I look at the day past it seems to be rather vanilla to me. But, then I remember when it was me reading the blogs of others who have gone before me.....others who inspired me to simplify my life, get rid of most of my stuff, and embrace this nomadic lifestyle. I hung on every word they wrote because they were living my dream.....whether they were visiting some cool place, or just hanging out with friends on a particular day, they were living my dream......they had broken free from the workaday life cluttered with schedules, possessions, and the daily obligations associated with living in a stix and brix home. No matter what they did in a given day it was interesting to me by virtue of the fact they had figured out how to break free and live a different kind of life.....the kind of life I wished for myself. Sunday was one of those days that reminds me of why we live this life......TLE and I are both big soccer fans. We coached all of our kids in youth soccer, and I was a professional soccer referee for 17 years. Before we became nomads the thought of spending a whole day, if not several days in a row, watching one soccer match after another was unthinkable because there were those pesky schedules, possessions and obligations. If you didn't take care of your stuff there would be a price to pay. Now that we are nomads we can spend 4 days in a row watching soccer, and not take away from anything else. And isn't that the essence of this life we live? There is time for everything.....if I wish, as we did in Sioux Falls, I can spend the better part of 9 days doing nothing but working on the coach. Back in our workaday life I had parts of 2 days on the weekend to work on projects, and I always felt rushed to get things done by Sunday night so we could return to our workaday life and schedule come Monday. On Sunday we spent the entire day watching 3 more soccer matches, the U.S. Open, and then the NBA final between the Spurs and the Heat......nothing tangible seemed to be accomplished, but it was. What was accomplished? Well, nothing in the traditional workaday sense, but in the nomadic sense a lot was accomplished. We lived Sunday the way we wished to live it.....not according to someone else's dictate. We lived Sunday on our terms, and we lived it well! And that is why I write an entry every single day of the week no matter what we are doing, or how interesting it seems to me.....I want to portray our daily nomadic life as completely as possible for those who are thinking about cutting loose and changing the way they live. I want to show that how ever you may picture, or configure your life on the road you can make it happen. How we live on the road is our own unique creation, and it has changed since we started, and will continue to evolve as our desires evolve. Everyone we know who is living successfully on the road does it differently.....there is no one way to do this. 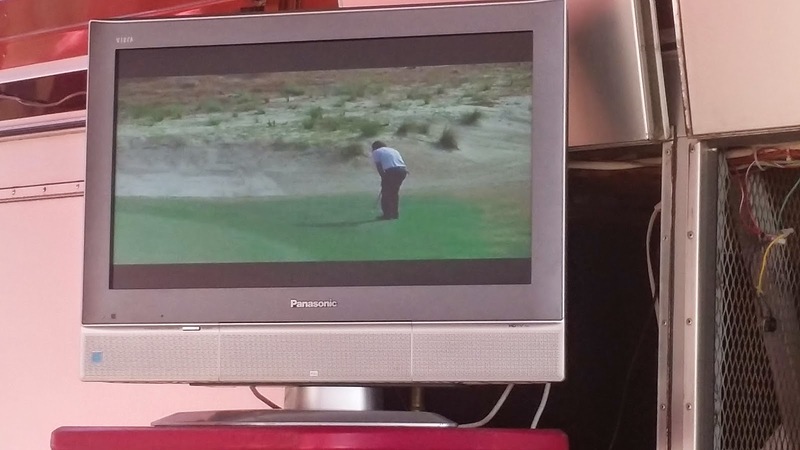 Saturday had four, count them, four World Cup games on tap, plus the U.S. Open going on all day long, but we are in one of the premier 4 season resort areas in the world, so sitting in front of a TV all day on such a beautiful day was out of the question. This time of year there is a flea market open every Saturday and Sunday of the summer just a couple of miles from TVC*, so after watching the first soccer match of the day we rode our bicycles over to see what we might find that we couldn't live without. We left for the flea market around 11 with the temps still in the low 60's arriving at our destination by 11:20, paid our $2 entry fee ($1 per person) and began to browse. After walking through the various isles twice I settled on a used Acushnet Bullseye putter, almost identical to one I owned 20+ years ago for $4......I know, I already have 2 other putters, but this is the one I have been looking for. TLE bought some fresh produce....apricots, zuccini and tomatoes. 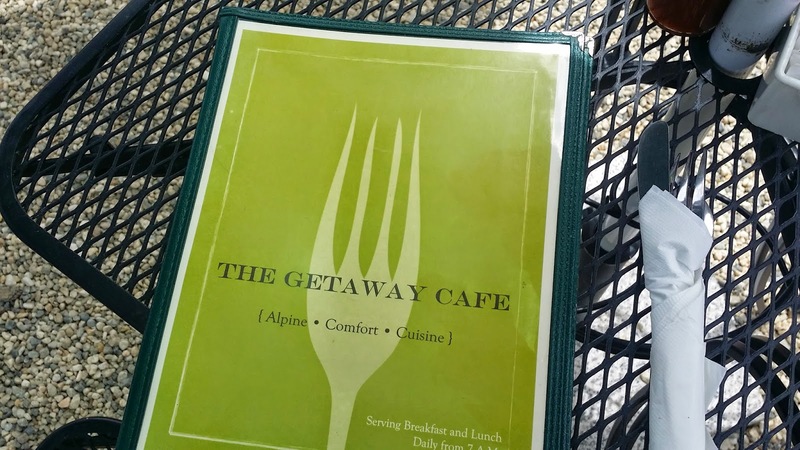 By this time it was close to 12:30, so we decided to continue our ride on up to Meyers to have lunch at the Getaway Cafe, which gets a solid 4.5 stars from Yelp on 177 reviews. We were not disappointed.....I had the Caesar Salad and TLE the Pastrami Ruben. Both entrees were excellent, plus the outdoor dining area is delightful....we will be back. From there we headed home to take in the balance of the FIFA World Cup matches slated for the afternoon. I had planned to sit outside watching soccer, but with the slight overcast we had it was just too cold, so I spent about an hour in the trailer cleaning up my "new" putter. As the weather warms the campground gets much busier, and with that the Verizon broadband slows down considerably......hopefully by Monday it will be back to normal again as the weekenders head for home. Who can get tired of this view? Friday marked the end of our first 4 weeks here in *South Lake Tahoe. Frankly, it does not "feel" that long, especially when we realize we have over 11 weeks to go! After a month we are only more certain we made the right decision to spend the summer here. We love the SLT* vibe, and the eclectic and diverse community. We have met so many interesting, and amazing people. While we have not officially started working yet, the rate we are paying is so good we both agree we could just live here the whole summer whether, or not we ever start working, however, we know we will be working before 4th of July, so we are just enjoying our life of leisure until then. Friday's World Cup schedule had three games (9 am, Noon and 3 pm) and we watched every minute of every single game, and in between the U.S. Open. The farthest we ventured away from our site was to take the trash to the dumpster, which is about 100 yards away.....otherwise we just sat outside enjoying the cool breezes, reading, and watching soccer and golf. The temperature took a dip Friday....it barely got to 68 degrees, and overnight it got into the high 30's again, and actually got down to 56 inside the coach. Around 5 pm we changed the channel to NBC to watch game 5 of the Stanley Cup finals between our L.A. Kings and the N.Y. Rangers. Following form, this game went to overtime just as the previous two King home games have gone. The Kings took an early 1-0 lead, but fell behind in the 2nd period 2-1, and were fortunate to score the tying goal late in the 3rd period on a power play. Ultimately Martinez, a defenseman for the Kings, scored the winning sudden death goal off a rebound late in the 2nd overtime period to give the Kings the championship. 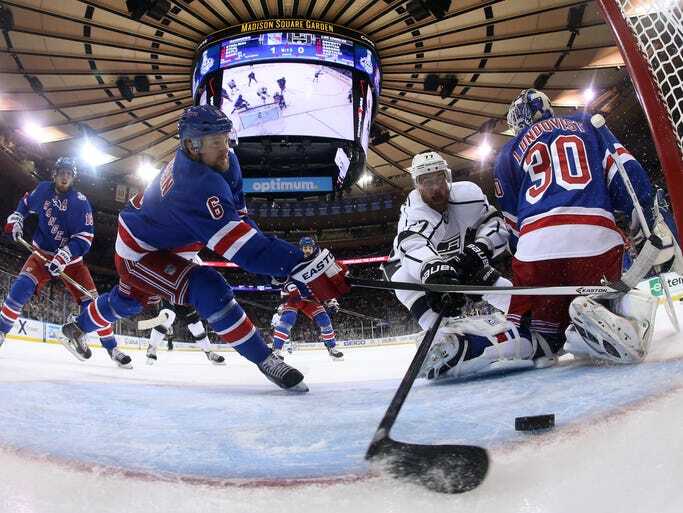 Frankly, even though the Kings won this series 4 games to 1, it was a much closer series than that with 3 of the Kings 4 victories coming in overtime......any of these three overtime games could have easily gone to the Rangers. After 4 and a half hours of watching this game we were wrung out, but so happy the Kings won their second championship in 3 years last night. Thursday felt like Saturday to me, not just because it is 4th Saturday, which, of course, it is.......no, it felt like Saturday because of the sports cornucopia that was on tap. Let me recount.......1) The U.S. Open golf championship on TV all day, 2) The first game of the World Cup (soccer) on at 1 pm, and 3) Game four of the NBA playoffs at at 6 pm. All that being said, before I spent any time watching sports on Thursday, I spent a few hours, starting at 9 am, helping set up the entertainment tent here at TVC*. It is in this tent that weekly karaoke parties are held, and movies are shown for the benefit of the campers. 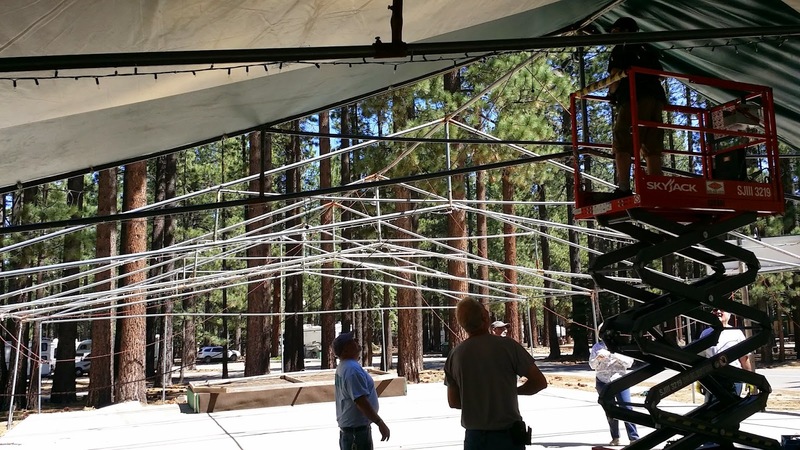 If the tent is going up that means the summer crowds are about to descend upon TVC*. By 11:30 we had the three roof panels installed, and secured, but they needed to sit in the sun for at least a day before we could stretch them out properly, so I headed home to watch the first game of the World Cup between Brazil and Croatia. There was only one game Thursday, but Friday there will be three games on tap, and for the next month there will be soccer pretty much every day. Then, just as the World Cup wraps up the Tour de France will commence on July 5th running until the end of July. TLE and I sat outside the rest of the afternoon watching soccer and the U.S. Open with a little reading thrown in for good measure......yep felt just like Saturday to me! 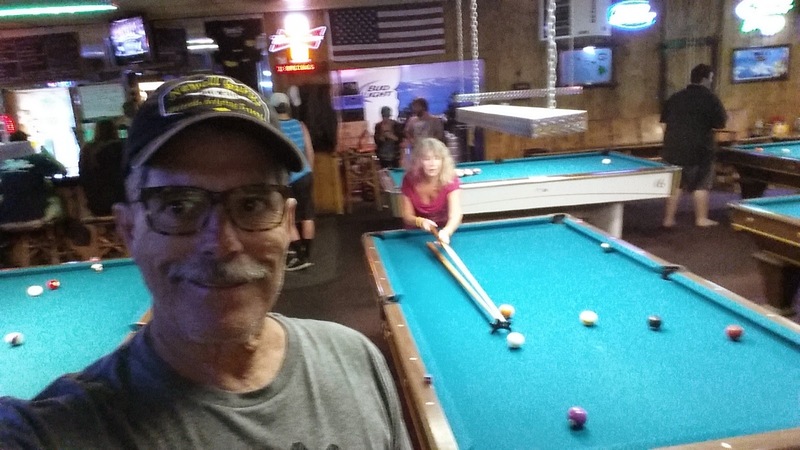 Around 4:30 I got a text from Debby (of Bill and Debby fame) asking if we were interested in going to play pool that evening around 7 pm, and we accepted. We met up at their motorhome just at 7 and walked over to Classic Cue to play some "9 ball". TLE, Debby and I have conceded that it is basically "us" against Bill.....sure, we try hard, and win a game here and here individually, but Bill is the pool shark in the group. I did improve over the first outing by winning the first and the last game, and TLE and Debby won a game, or two, but Bill was much sharper than the three of us combined......:D Fortunately, the basketball game between the Spurs and Heat was on the TV right by our table, and I was able to watch the Spurs, in between shots, dismantle the Heat once again to take a 3 games to 1 edge in the best 4 out of 7 game series. The Spurs need one more win to clinch the championship. Wednesday, for the first time since mid February I broke below 190 pounds coming in at 189.6! All that hard work is starting to pay off again, and my conditioning is getting back to where it was before my hernia surgery. Now that the weather has warmed up and seems to be staying warm we decided to visit the beach again Wednesday, but before we headed to South Lake Tahoe Beach we headed out about 10:30 on another bike ride up the Camp Richardson bike path.......I don't know if that is its official name, but that is what I call it. TLE rode to the end of the bike path just as she did the day before, and I continued on to the Emerald Bay overlook. Once again I was not trying to best my previous best time, but that day will come again in the not too distant future. I arrived back at the coach around 12:45, took a shower, had some lunch, did a little reading and then around 2 we loaded up the VW with our beach chairs, umbrellas, towels and books for the drive over to South Lake Tahoe Beach to spend the afternoon relaxing and enjoying the beach atmosphere. 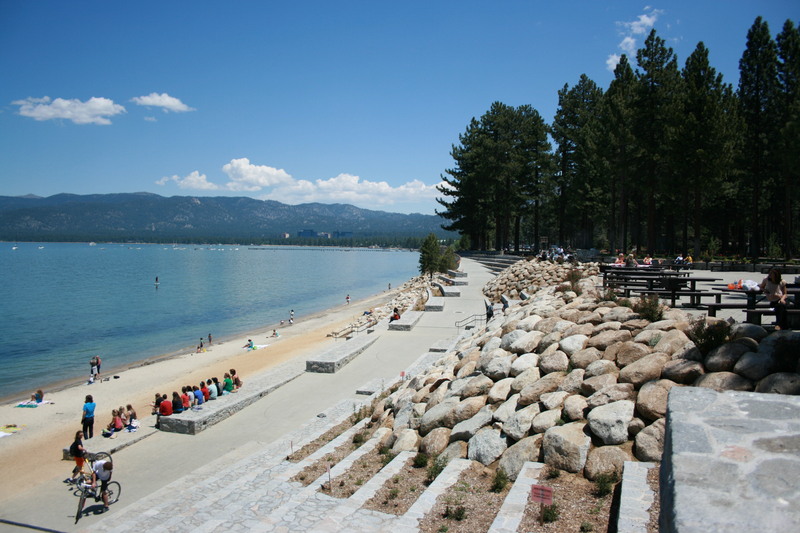 Unlike our first trip to the Tahoe Keys beach, there were a lot of people at the beach, and in the water. I was not ready to go in the water this day, but maybe the next time.....this time of year (early June) the water is still pretty cold. We sat reading and just enjoying the long view looking north up towards Tahoe City until 4:30, then it was time to head to Raley's to pick up a few items, then home in time to watch game 4 of the NHL Stanley Cup finals between the Kings and Rangers. On the evening's menu for dinner were regular hard shell tacos chased with a Leinenkugel Summer Shandy. If the Kings had played as good as those tacos tasted they would be celebrating their second Stanley Cup finals win in 3 years, but alas it was not to be......they lost a very closely fought game 2-1........twice in the 3rd period the puck stopped just short of crossing the line.....it was like there was a force field at the line stopping the puck. We closed out the evening watching another episode of "So You Think You Can Dance". On "The Edge of Tomorrow....."